The Arctic S113BT Speaker is yet another portable speaker to be released into the market. It has two methods of wireless connection, Bluetooth and NFC. Arctic proclaim on the box of the speaker that you shouldn't be fooled by the size, but do we agree? The speaker consists of two 3W stereo full range inner drivers, each of which sits in front of a bass radiator (and makes use of AAC which allows compatible iOS devices to stream lossless audio and apt-X technologies for greater audio performance too) which are housed in a mixture of silicone and metal. 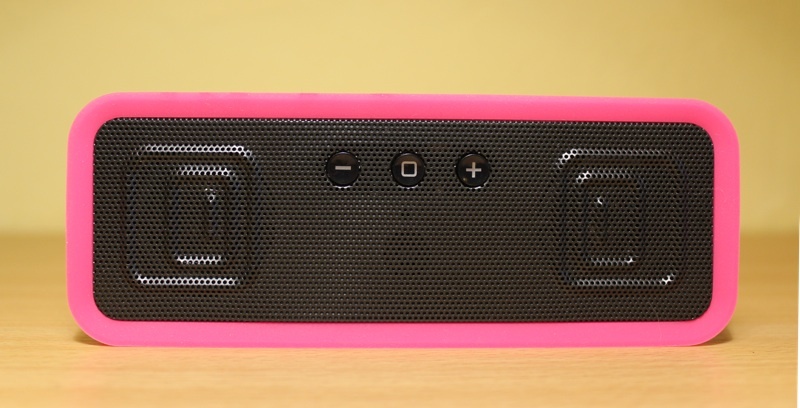 The silicone wrap acts as a functional bumper and grip, but is also the jewel of the speaker's exterior stylish appearance which is available in a variety of colours. These include pink, orange, green, blue, black and white. We've been listening and using the Arctic S113BT over the past two months and it's proven to be a solid and robust speaker with a design well suited to its portability. 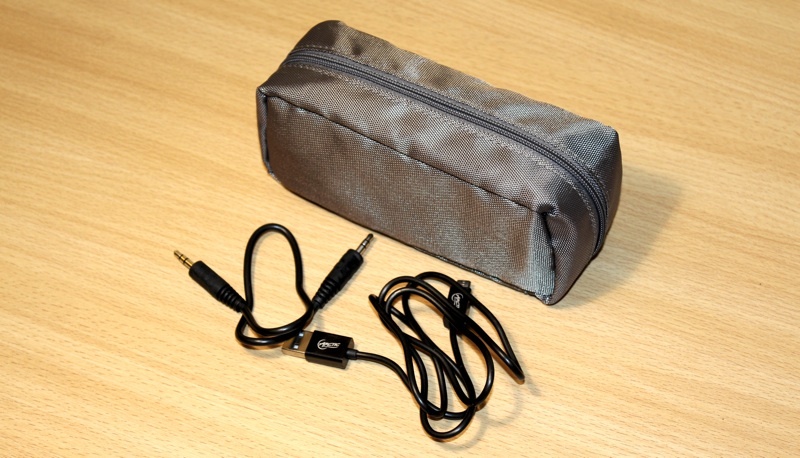 A few little extras are included in the box with this speaker, a zip carry pouch, a charging cable and an auxiliary cable. The speaker itself can connect via NFC (an NFC capable device will connect to the S113BT when just hovering near the speaker), Bluetooth 4.0 and you can use an auxiliary input too. Bluetooth 4.0 is backwards compatible with older versions in this instance and connectivity was smooth; and when a device that had been previously paired came into range (around eight-ten metres) it would automatically connect. The front of the speaker has volume buttons which adjust the speakers volume when playing via Bluetooth, a button within the middle of these buttons makes the speaker discoverable via Bluetooth when held down. The battery life over Bluetooth with high volume levels exceeded the eight hour claim from Arctic, we squeezed another 30+ minutes out of it. We were outstandingly pleased with this benchmark, and standby time is supposedly 700+ hours, so you could just leave this on for nearly a month and not have to reach for the off button on the speaker's righthand side. No battery indicator is present on the speaker's body itself, but the device paired is fed a battery measurement. The Arctic S113BT has BIG volume! Oddly, from our tests, the volume is a great deal louder when streaming audio via Bluetooth as opposed to using an auxiliary cable, and rarely distorts. The quality of this huge sound is staggeringly impressive too. We couldn't quite believe the high class quality that was coming out of this little portable wireless Bluetooth speaker! The 30Hz – 20kHz ranges of frequencies are concise and tidy, the bass is snappish and exceedingly bigger and bolder than the Arctic speaker's dimensions. The mid and high ranges are equally as remarkable, with crunchy highs and a balanced mid-range. Vocals on musical tracks are notably pronounced and individual elements of a musical track like 'I Feel Like Dancin' by 'All Time Low' has lots of heavy beats with a very definite vocal style, and the rendition from the S113BT was flawless. So whether you want to pump a room full of rich music that a family or a group can enjoy, use intimately, or make a keynote presentation in the board room, the Arctic S113BT speaker makes sure that you will always be able to rely on it, with its long battery life, lightweight skinny but durable design and breezy Bluetooth performance. This is one of the best portable (not ultra portable) Bluetooth stereo speakers, at around $69 within the USA and £45 within the UK, that has come into our studio and we've tried a lot!